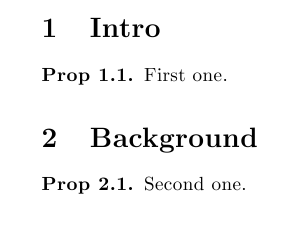 I want to insert several new propositions in my second section,and name it 'Prop s','Prop t'...，I hope that anyone can help me :) Here is my code. 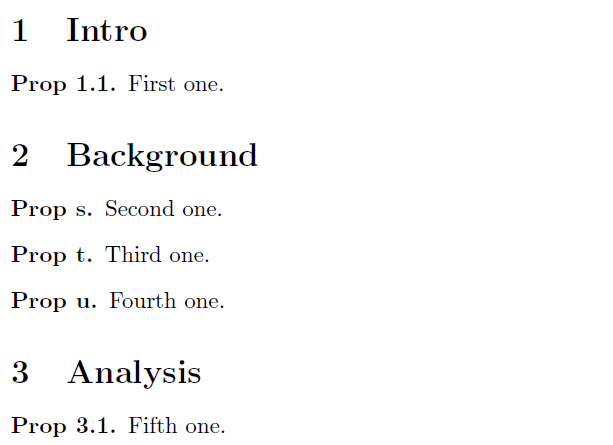 The following example shows how to switch the environment's numbering system from 1.1, 1.2, etc to a, b, etc -- and also how revert to the initial numbering system. Not the answer you're looking for? Browse other questions tagged numbering theorems amsthm or ask your own question. how to enumerate theorems using letters? How to enumerate theorems using letters with amsthm without losing the section numbering?